Did you know our Myrianthousa Spa is magical? It has special powers which can transport you to another world - a different climate, a different state of mind and a different place in time. The one thing you can be certain about at the spa is that by the end of your journey, you will be a changed person. And what better month to visit than February, the month of Valentine’s day. Bring your loved one, leave your busy lives behind and drift away with one of our romantic valentine spa journeys. Relax in the hydrotherapy pool, as the water massages your back, and drink in the view of nature, the trees, the wildlife, the sky. It’s almost hypnotizing and one by one you will feel your worries begin to fade. Save some energy though, as just behind the pool, a luxurious thermal sequencing journey awaits. Cleanse in the herbal steam room and inhale the scent of eucalyptus. Refresh with an ice mist infused with peppermint and enjoy a tropical shower that transports you to a rainforest with warm dripping rain. Enhance your circulation in the sauna with captivating mountain views, and last, but not least, don’t forget to cool down with an invigorating session in the snow cabin. A short time with the ice stalagtites should wake you up and give you the boost you need to make it downstairs to your treatment room. For a Valentine’s treat, why not try the champagne full-body massage and Rasul treatment with chocolate mud? Or unwind in our indoor or outdoor heated whirlpool, sip on sparkling wine and nibble on chocolate-dipped strawberries. As you gaze out onto the valley, you won’t find it difficult to imagine the Venetian Queens of Cyprus, who used to bathe in the natural healing spring waters trickling below. The best part is, you too can bathe in the medicinal spa water, with a Theouha Relief Bath Ritual. It’s known not only for softening the skin, but for fighting germs and relieving swelling and joint pain too. At Myrianthousa, all our treatments have been inspired by the surrounding nature, whether it’s the wine body peel or goat-milk head massage. 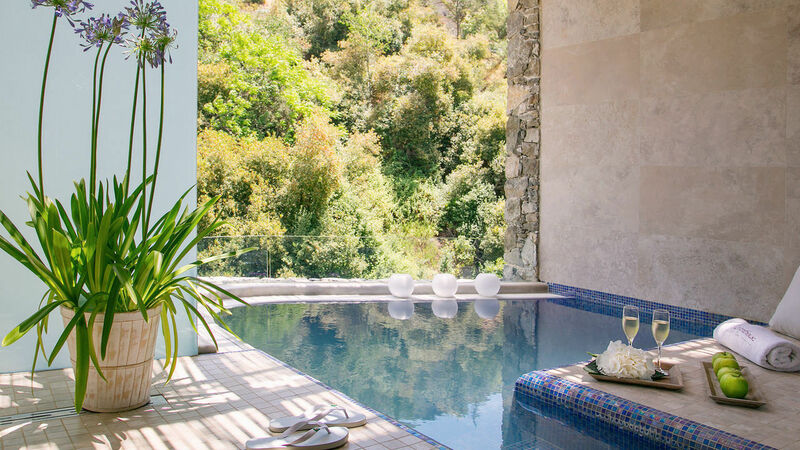 Our Mediterranean-inspired Temple Spa products capture the health benefits of the regions’ botanical treasures and Kurland skincare harnesses the power of nature in specially designed treatments just for you. And in February especially – it’s for those who love each other. Happy Valentine’s Day.